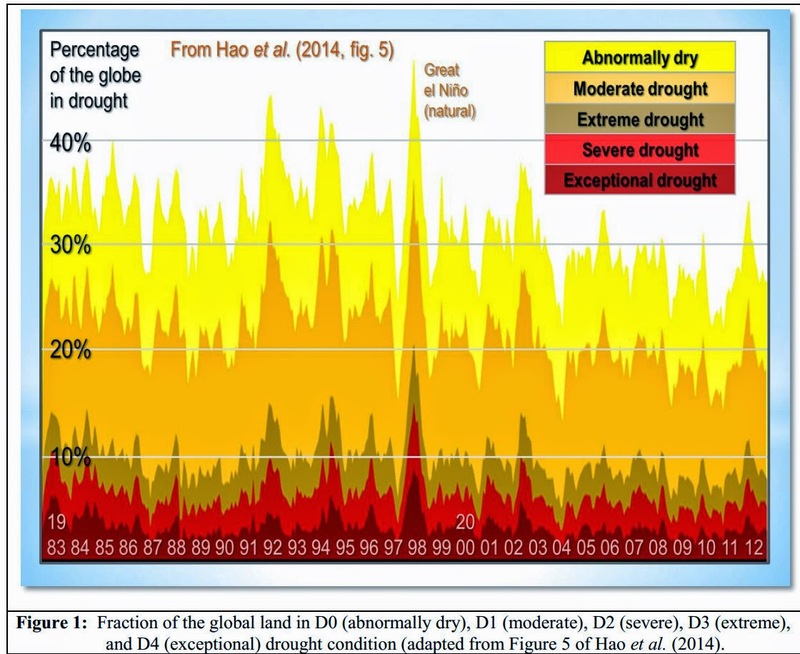 A paper published today in Palaeogeography, Palaeoclimatology, Palaeoecology finds drought in North China is linked to cycles of sea surface temperatures in the tropical Indian-Pacific Ocean and the East Asian summer monsoon (EASM). 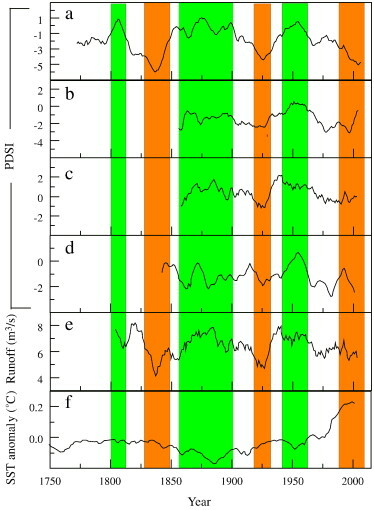 In turn, sea surface temperatures are linked to natural ocean oscillations and cumulative solar activity, and both the East Asian summer monsoon (EASM) and ocean oscillations have been linked to solar activity as a driver. The paper also shows the North China drought from 1827-1850 (during the Little Ice Age) was more severe than recent drought 1984-2012 and that drought conditions have returned to the average range since 2012. These findings thus clearly demonstrate drought cycles are controlled by natural variability of ocean oscillations and accumulated solar activity, not man-made CO2. Several other papers also find the hydrological cycle linked to solar activity, another of many potential solar amplification mechanisms. Temperature induced moisture stress limits the tree growth in North China. The PDSI reconstruction since 1767 AD is regionally representative. The reconstruction exhibits a significant drying trend since the mid- 1960s. Drought in North China is linked to the SST in tropical Indian-Pacific Ocean. 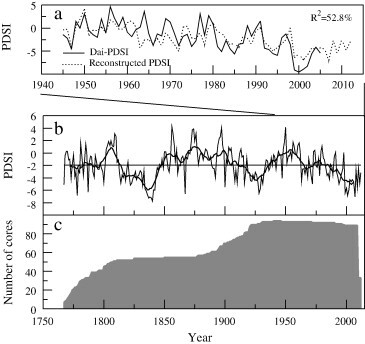 Using tree-ring data from the northernmost marginal area of the East Asian summer monsoon (EASM) in North China, May–July mean Palmer drought severity index (PDSI) was reconstructed back to 1767 AD. The reconstruction captured 52.8% of the variance over the calibration period from 1945 to 2005 AD and showed pronounced pluvial periods during 1850–1905, 1803–1811 and 1940–1961 and dry periods during 1814–1844, 1916–1932 and 1984–2012. These anomalous periods have previously been reported in other parts of North China. Spatial correlation analyses and comparisons with other hydroclimatic indices in North China indicated that our new PDSI reconstruction could represent spatial and temporal drought variability in this region well. Our work also suggested that the drying tendency currently observed in the northern part of North China (including the study area) is consistent with the weakening of the EASM. Meanwhile the drying trend was seemingly restrained at present in the southern part of North China. Spatial correlation patterns with global sea surface temperature (SST) indicated that the regional hydroclimatic variability in North China was tightly linked to SST over the joining area of Asia and Indian-Pacific Ocean (AIPO), especially over the tropical western Pacific. When SST from prior November to current July (NJ-SST) in the AIPO area was anomalously high (low), the thermal contrast between Asian land and ocean was weakened (strengthened), and the EASM was correspondingly weakened (strengthened), thereby causing droughts (pluvials) in North China. The results of this study do not only provide useful information for assessing the long-term climate change in North China, but also suggest that abnormal variability in NJ-SST over the AIPO area could be used to forecast hydroclimatic conditions in north China. The "root cause" is natural climate cycles, one of about 1,000 years and another of 60 years superimposed on the first. The current slight cooling since 1998 will continue for another 14 or 15 years, and about 500 years of long-term cooling is due to start within the next 100 years or so. These natural climate cycles are compellingly correlated with the inverted plot of the scalar sum of the angular momentum of the Sun and all the planets, possibly because of planetary magnetic fields which reach to the Sun and may affect its radiation and cosmic ray flux. Because the temperature gradient in a planet's troposphere is the state of thermodynamic equilibrium which the Second Law of Thermodynamics says will evolve, the planet’s supported surface temperature is autonomously warmer than its mean radiating temperature, so warm in fact on Earth that we need radiating gases (mostly water vapour) to reduce the gradient and thus cool the surface from a mean of about 300K to about 288K, this being confirmed by empirical evidence (as in the study in my book) which confirms with statistical significance that water vapour cools rather than warms, all these facts thus debunking the greenhouse conjecture.